Summertime is a season and a mindset for me. It is a season to avoid being booked and busy as much as possible, to allow time to be free to savor summer’s simple pleasures. Over the weekend, this included a trip to the Saint Paul Farmer’s Market, a meal outside on the patio at a favorite restaurant, picking a few weeds in the garden, inviting my cousin over to hang out in our back yard, working up a sweat doing yard cleanup, going to the pool for a swim and sitting in the sun porch listening to rumbling thunder and watching rain pour down, giving our garden a thorough soaking. The summer mindset is also reflected in the food we eat. We like to eat outdoors in our back yard on the patio as much as possible. The availability of a great variety of fresh produce at the market and from our garden shapes our menu. We make frequent use of the grill. Grilling has the multiple benefits of allowing us to cook outside on the patio, avoid heating up the house and further influences our food choices toward simple, classic summer fare. 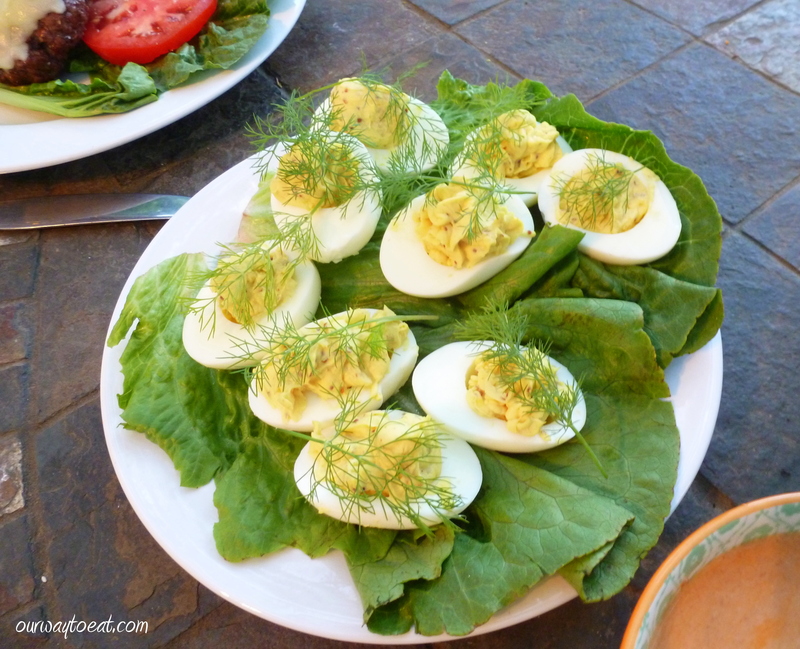 One classic summer food staple that I’m thrilled to see back in vogue are deviled eggs. Why wouldn’t these re-emerge and get trendy? They are perfect, tasty bites, extremely simple and they can be made with all kinds of interesting ingredients. I’ve seen deviled eggs with crab meat, bacon, capers and even caviar-topped deviled eggs on food blogs and restaurant menus. I like a classic deviled egg the most, and I don’t follow a recipe. I boil, cool and peel the eggs, mash the yolks and mix in minced onion, a little grainy Dijon mustard and just enough light mayo to make them creamy. I attempted to pipe the filling back into the egg white halves from a pastry bag, but I chose too small a tip to allow the filling’s grainy mustard to squeeze through, so the piping experience started out with a few pretty, piped deviled eggs, then an explosion, followed by me filling the rest of the eggs with a teaspoon. Garnish is a must, especially with the teaspoon egg filling-method. In the off-season, I’m still a fan of a sprinkling of paprika, but in the summer, chopped chives or dill are my go-to garnish. I call the dill from our garden “Electric Dill” because it is so bright and fragrant, and the dill flavor just pops- electric! Today was one of those days that I was half-way between two dinner ideas. 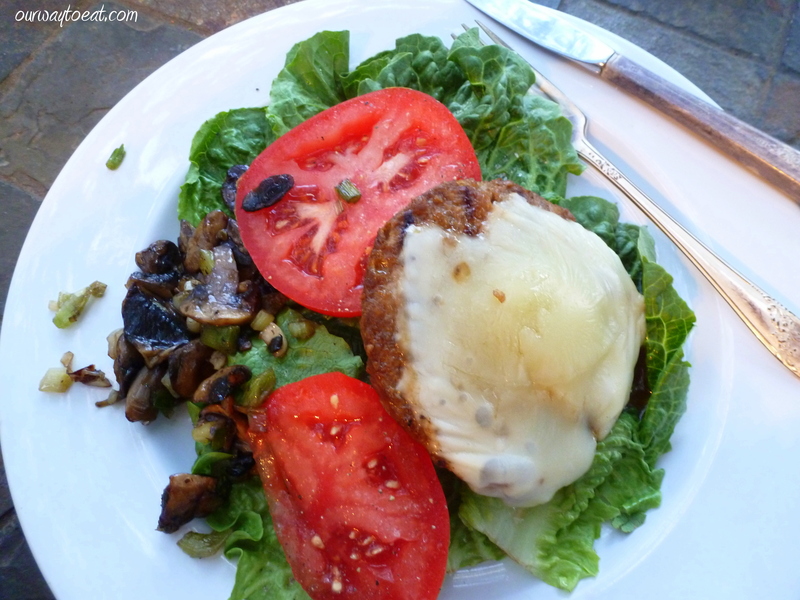 Bjorn had thawed some lean ground beef raised by his uncle, and I had a hankering for a veggie burger with all of my favorite burger toppings, but also a salad. From what I’ve been reading, it is better not to eat bread and high-glycemic, addictive [delicious] carbs at every meal. The idea of a Cheeseburger Salad was born. I am sure I’m not the first to think of it. Mine ended up somewhere in the realm of California Burger meets Mushroom and Swiss, but the topping possibilities are only limited by your imagination–avocado, fried egg, pickles, sauerkraut and crispy bacon all come to mind. The basic premise is to deconstruct your favorite burger, up the veggie count, leave out the bun, and have yourself a great salad. Bjorn grilled up a burger for himself, and a veggie burger patty for me, and topped both with thinly sliced provolone cheese. 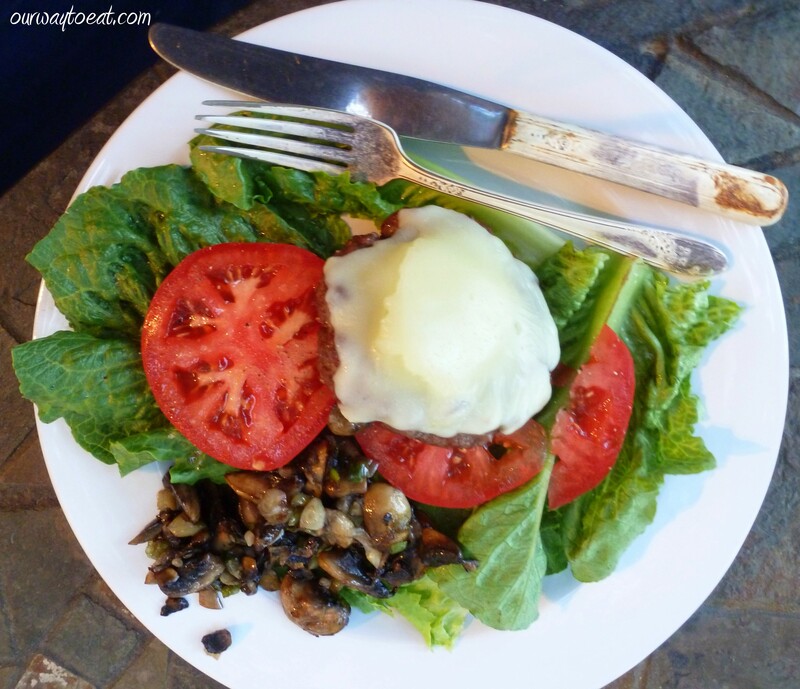 We sautéed mushrooms with some onions on the grill’s side burner, and served the burgers and sautéed mushrooms and onions on a bed of lettuce leaves with sliced tomato from the market. As a dressing, we used a little leftover creamy taco sauce that I mixed up for another meal which consisted of smoky chipotle and garlic salsa mixed with a little light sour cream. 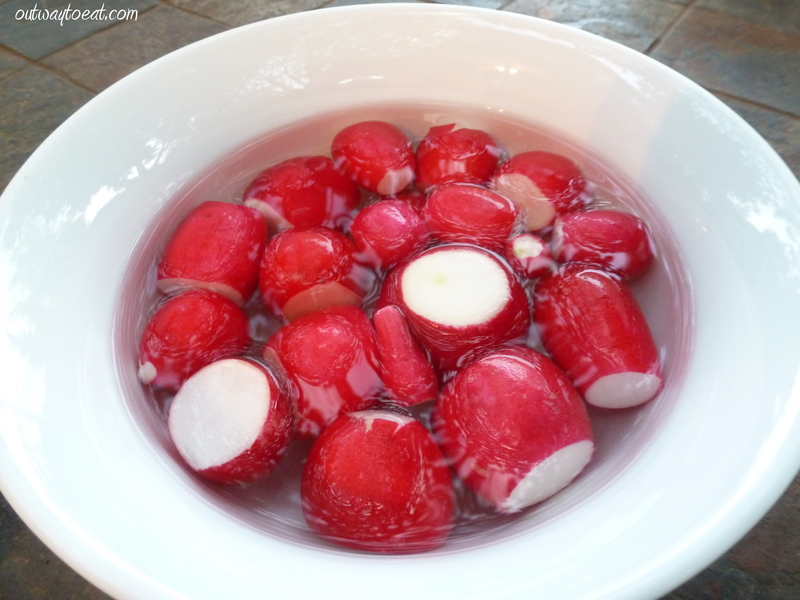 We rounded out the meal with a few bright red radishes from the farmer’s market. We are both obsessed with farmer’s market radishes at the moment. They are brighter and spicy, and of no comparison to most radishes I’ve tasted from the grocery store. I’ve been keeping a bowl in water in the fridge so that they are ready for snacking and ready to be served at any meal, including breakfast! I cannot wait until radishes from our garden are ready to eat. 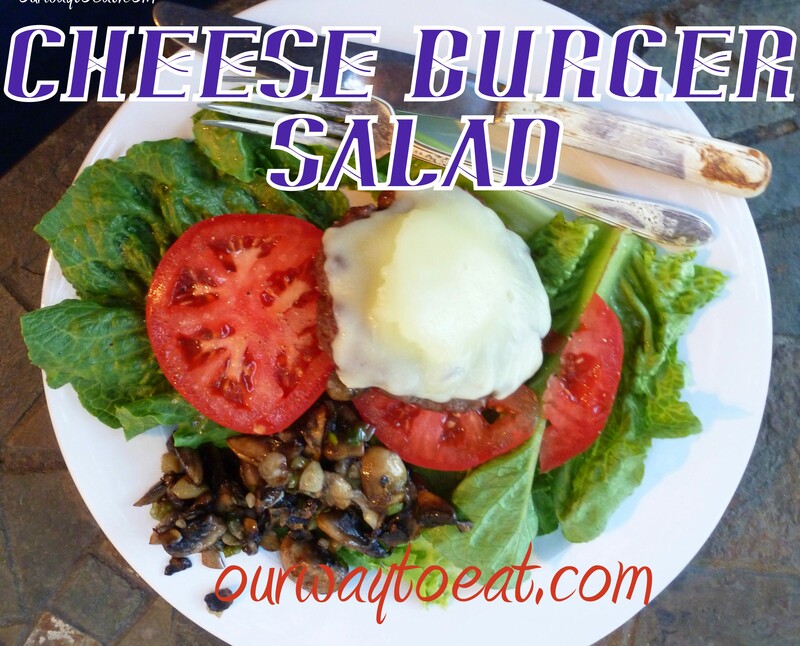 I’m sure I’ll make Cheeseburger Salads again, and will certainly make more deviled eggs. Even with the richness of a deviled egg, and melted provolone, the meal felt just little lighter. 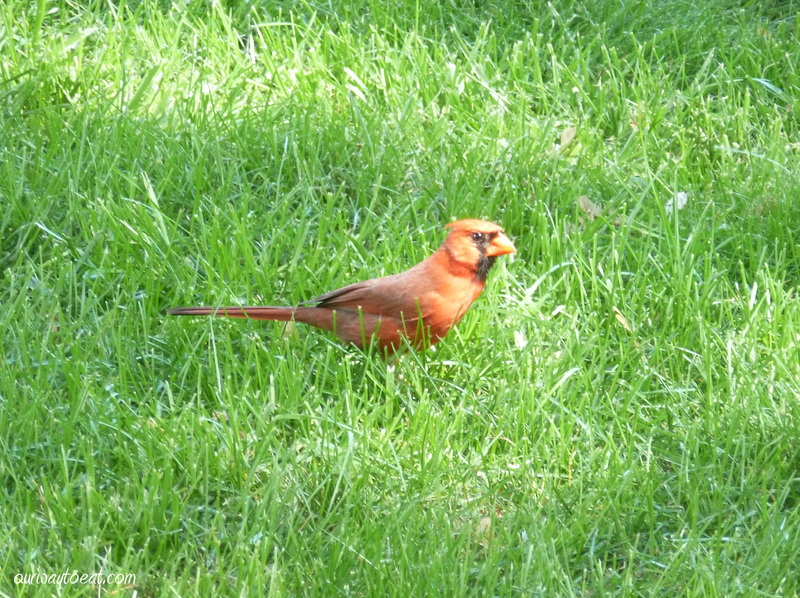 After the deviled egg filling vs. piping bag incident was cleaned up, the meal came together quickly, giving us time to sit back and watch the cardinals hanging out in the grass. This entry was posted in Classic, Farmer's Market, Grill, Lightened Up, Locally Grown, Omnivore, Our Garden, Vegetarian and tagged cardinal, Cheeseburger Salad, deviled eggs, dill, farmer's market, lettuce, radishes, sauerkraut, sauteed onions and mushrooms, Tomato, Veggie Burger by Our Way to Eat. Bookmark the permalink. What a good idea to leave the bread out of it. At our age we need to cut down the carbs.